Freestanding ranges in the breakfront, cupboard style can safely hide ovens below the cooktop and OTR microwave/oven/hoods above the cooktop. 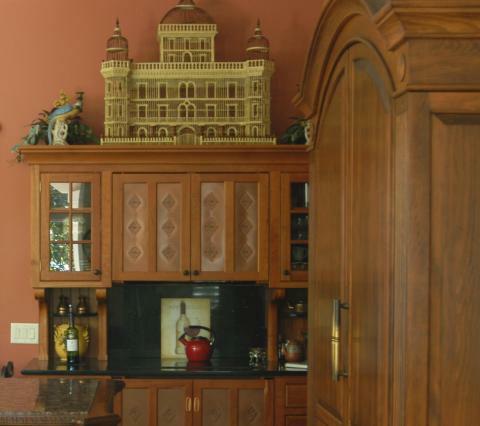 Our armoire style ranges (see the last image in this article) are capable of concealing full sized electric cooktops as well. 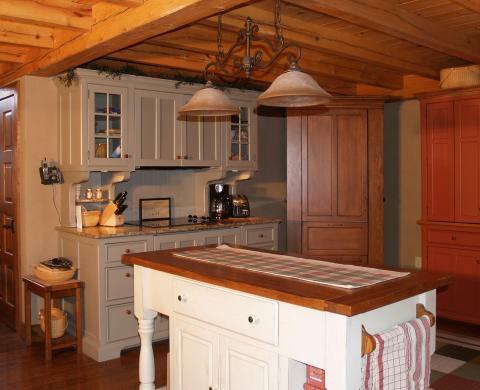 Shown above is a TP72T-MH (T=Tall Upper Hutch) over B72-OC in Hamptons Cherry. These freestanding units can accommodate most 30″ electric wall ovens, 30″ over-the-range microwave/hoods and 30″ electric Cook tops. 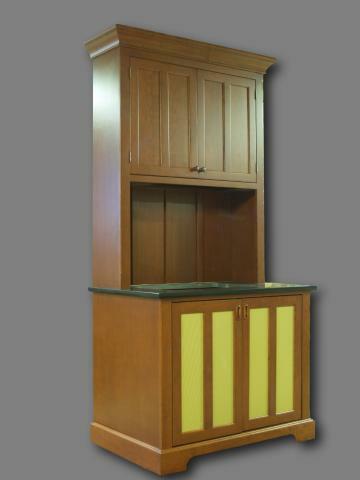 The B72 base units (here shown as the bottom piece) are available in many combinations. They can provide storage options only (B72-T) or can conceal an oven in an island sized workstation. Or combined with TP72 units, they can become a complete range, concealing microwave and thermal ovens while revealing a discrete glass cooktop that can be used as a worktop when its burners are not being used. This unit is similar to our B40 unit, but it includes two flanking stacks of drawers that are intended to store cooking vessels, utensils and even spices. If space is not a problem, AC29-SIDE units can attach to the sides of this range, adding extra butcher block or stone surfaces to the work space. 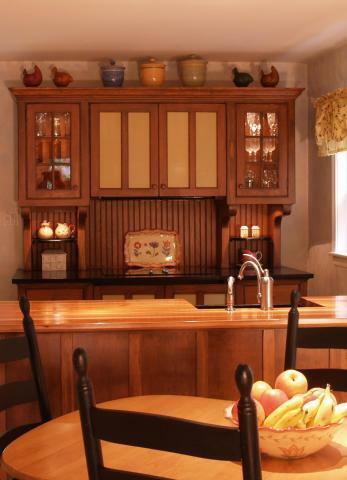 When selecting these units, pay particular attention to the cooktops that are available. Only selected YT units can be used above gas cooktops, so if you need a gas cooktop, downdraft and modular models can be used or a hood above can be ordered. Also note the various storage options behind the center doors for the units that don’t utilize ovens. Most non-commercial ovens (up to 30″) that are rated for installation under a cooktop can be used. Typically, this requires the ovens and cooktops to be rated by U.L. to be compatible with each other, which usually means that the appliances must be made by the same manufacturer. The TP72 top units can only mount above a B72 series base unit. It is available as a TP72 storage unit that can be mounted above a worktop that does not contain a cooktop. 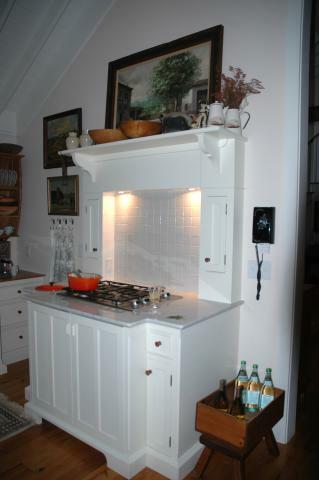 Above a cooktop (as shown here) a TP72-MH can conceal a built-in combination microwave oven and exhaust hood. The same unit can be mounted above a B72 unit that does not have a cooktop. In this case, the exhaust fan can handle odors generated by small, movable appliances like electric frying pans, crock pots, and toaster oven/broilers. Another model, the TP72-H maintains the look of furniture by concealing a very thin profile exhaust hood that slides out over the cooktop when it is on and all but disappears when it is off. These units combine with B72 units that have electric or selected gas cooktops. 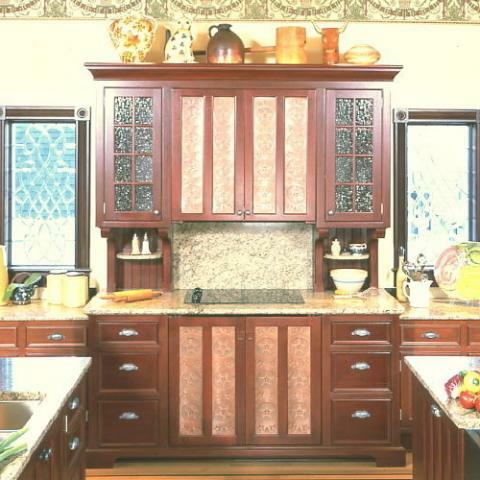 Other TP units are designed to complete 6′-0″ wide pantry or hutch combinations that do not have a cooktop. Combined with a B72-O base unit which can store an oven or a B72-T pantry base, these units can provide abundant work space and storage space in the “reach zone”. This combination is ideal to use against a wall opposite another B72-C that is used as an island range. Above, the perforated aluminum door panels that hide both ovens match the paint color of the entire piece. 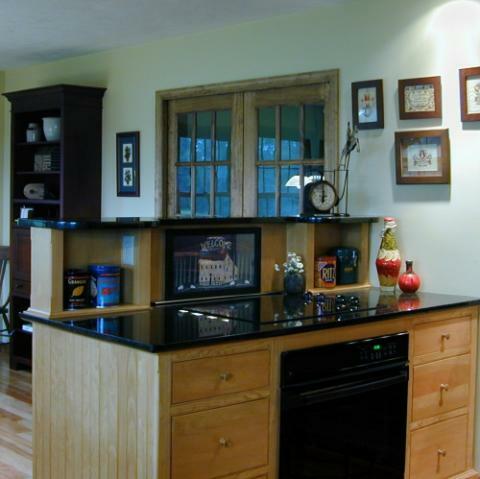 Above, the honed black granite countertop almost conceals the black Ceran cooktop! The historic building restrictions of this community applied to the interior of this Victorian restoration in that the trims, flooring, wall paneling and ceiling could only be restored, not changed. 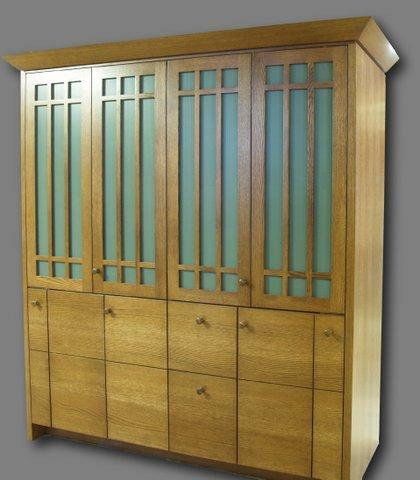 Therefore, freestanding furniture was a welcome enhancement that did not at all interfere with the room’s finishes. This close-up view shows the detail of the punched tin door panels that conceal both ovens. And of course we can’t ignore the decorating possibilities that freestanding pieces allow! The range above has Grid Doors with Midnight Black perforated metal inserts in front of the microwave hood and glass inserts in the flanking doors. Another TP72-MH/B72-OC range, shown with optional interior lighting behind glass doors. When a range doesn’t have flanking storage areas, it becomes this wide. This PS40G-H over B40G-OC Range with a gas cooktop will have a slide-out exhaust hood and a hidden wall oven. If it had been built for an electric cooktop, it’s appearance would be the same. 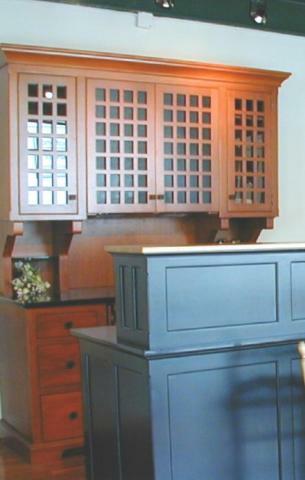 It is shown in Hampton’s Cherry with custom color vented door panels. 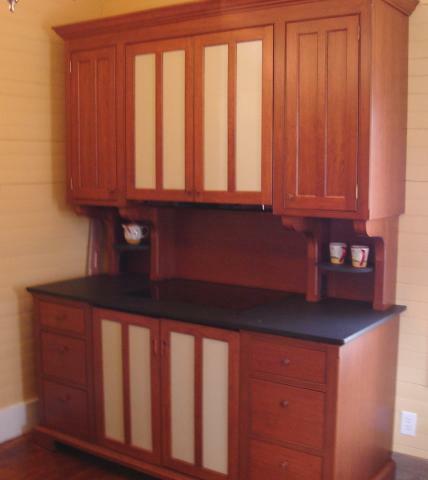 When concealed appliances are not a priority, a range can be placed in an island. Here, the island B72 features a cooktop that is vented with a telescoping downdraft power vent behind an exposed oven. The unit above the cooktop conceals the work surface from being seen from the adjacent dining area. The custom range above conceals an electric wall oven and features an exhaust hood with a remote fan above a gas cooktop. Note the opportunities that freestanding furniture allows concerning the variety of uses for the spaces between each piece. So what could be inside this one? How about a countertop that has a 240V 24″ four burner cooktop and a sink, a 24″ oven under the counter top and an over-the range convection oven above the cooktop! 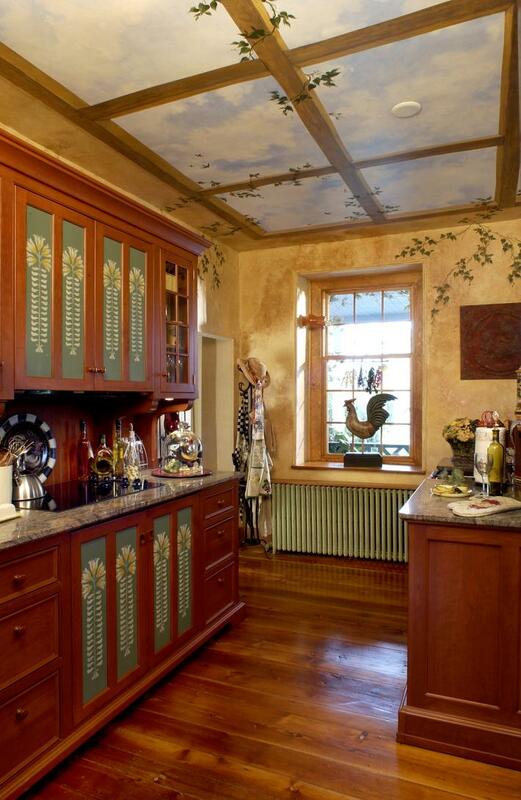 Those little doors hide a pull out spice rack on the left and tray/cookie sheet storage on the right. The custom unit was created from our Stealth Kitchen Modules line and features our Mission styled grid doors and our Craftsman Oak stain on quartersawn white oak.